In Part III of my analysis I began making the suggestion that Fragment IV and V of the Canterbury Tales among different manuscripts should be consolidated to reflect the relationship between the Clerk’s and Merchant’s tales, along with the relationships that unfold once the Merchant’s Tale finishes. While I made the argument between the relationship of the Merchant’s and Clerk’s tale in light of content and structural similarities, I will further explore how the Merchant’s Tale speaks in the same way to the Squire’s and Franklin’s tales, outlining the necessity of building an uninterrupted narrative comprised of the Clerk, Merchant, Squire and Franklin. The first, and also easiest way of doing so would be to first look at the distinction in tale ordering between the Hengwrt and Ellesmere manuscripts with a discussion of what consists of scribal invention, and relying on common sense to decipher the original composite. 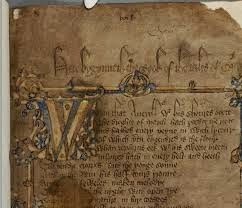 The Merchant’s and Squire’s endlinks follow each tale in both manuscripts, but they are used to introduce different tales. The importance of this will become evident as the analysis continues. A table would best depict the differences, but for the purposes of this blog, I think I can present it in list form as well. Ellesmere ordering: Merchant’s Prologue, Merchant’s Tale, Merchant’s endlink to the Squire, Squire’s Tale, Squire’s endlink to the Franklin, Franklin’s Tale. Hengwrt ordering: Squrie’s Tale (with no introduction), Squire’s enlink to the Merchant, Merchant’s Tale, Merchant’s endlink to the Franklin, Franklin’s Tale. As can be seen, Hengwrt has a different organization, and seems to be missing a component, the Squire’s introduction (which would only make sense if it followed another tale within the group). As was seen in earlier parts of this analysis, since Hengwrt was a sort of prototype manuscript, it is feasible that certain pieces came in later. Not to mention, as was discussed last time, it appears most probable that the scribe copied the pieces as they were received, only editing for content after the fact. If both of these ideas are taken into consideration we can trace how one manuscript morphed into the other. However, what is interesting to note is that in this section, unlike any other, the scribe attempted to make the pieces fit as he was writing them by fabricating links. However, in a larger context, as I will explain, the added links make little sense, and metrically speaking are poorly written in an obvious attempt to create relationships that simply were not there. Ellesmere is one of the few manuscripts that contains the Merchant’s endlink, however, when other manuscripts include it, it never moves away from the Merchant. Due to the Host’s reference to the deceitful wife of the Merchant’s Tale (May), as well as his naming of the Merchant in the Merchant’s endlink, it shows its position to be right. Further, most critics will agree that the stanza is Chaucerian, and not a scribal invention, so the fact that it is omitted from numerous manuscripts is not because it was believed to be inaccurate, but probably because it did not yet exist, or was not attached to all of the extant copies of the Merchant’s Tale. Further, its omission from the different manuscripts is the probable motive for separating the Merchant and the Squire; without the endlink from the Merchant’s Tale, there is little binding the two. Yet once the connection is found, the case can be made as to why they belong in one group. Several editions, including the Riverside Chaucer sever the Merchant’s endlink from the tale, with a notation of the beginning of a new fragment right before the Squire’s Tale. This is a modern editorial invention and has no historical precedent. All manuscripts that contain the Merchant’s endlink combine the Merchant’s Tale and Squire’s Tale into one group, using the flow of the stories as reasoning for keeping them together; The Ellesmere manuscript simply announces the Squire’s Tale as soon as the Merchant’s endlink finishes, with no announcement of a new fragment. This is still a very roughly laid out idea in need of refinement as I am sure some things that make sense in my head are not coming across on paper (or blog). However, if you follow the order of edits between the manuscripts, it should become slightly more clear even if not yet convincing. I am not going to clean this area up yet, but rather proceed with the argument, and in the next section discuss the merit of the Squire-then Franklin ordering as opposed to Squire-then Merchant, relying on context to guide the analysis.